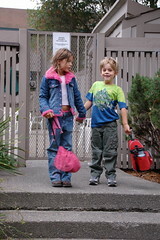 Today was the first day of school for the kids. I love how they always greet it with such enthusiasm and a zest for life. Despite his calm demeanor in this picture, Bjørn was bouncing off the walls with excitement this morning. It literally lasted the entire school day, all the way through dinner, an hour-long swim, and further. I’m hoping he’ll eventually crash and fall asleep. He’ll need it if he wants to attack tomorrow with the same vim and vigor. 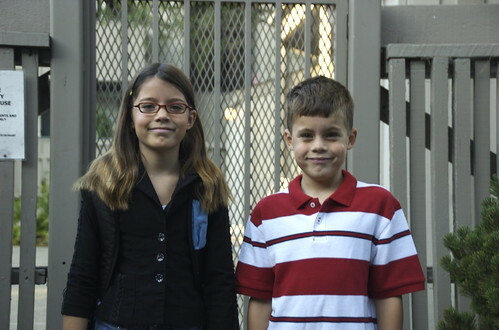 I’ve included a picture from the first day of school two years ago. Isn’t it wonderful how their personalities shine through? I’m glad they crack me up. Even when I’m so tired I could weep. By the way! I followed my wonderful readers’ advice and had the kids pick out their clothes before going to bed, I got up an hour before the masses, breakfasts ready, and had lunches packed last night. Thank you, your practical (do-able!) advice really helped! Tomorrow will be my first day at a new job. I’m hoping I get more sleep than last night! The first day of school is always exciting in our house, too! This year, I will be sending one off to 3rd grade and one to Kindergarten. I don’t know what I will do with just one in the house. Well, I’ll be working from home – just with less distraction! Our first day is September 5th. I love the photos – they’ve certainly grown in the past two years, eh?